In a large stockpot, bring water to a boil. Cook corn with lobsters until red in color, about 8-10 minutes. Shock lobsters in an ice bath to stop cooking, then remove and set aside. Remove meat from the shell and cut lobster into 1/2 inch chunks. Set in a bowl and chill in the fridge until cold. Cut corn from cob with a knife and set aside in a dish. In a large mixing bowl, gently combine corn and lobster meat with mayonnaise, celery, parsley and cayenne. Season with salt and pepper. 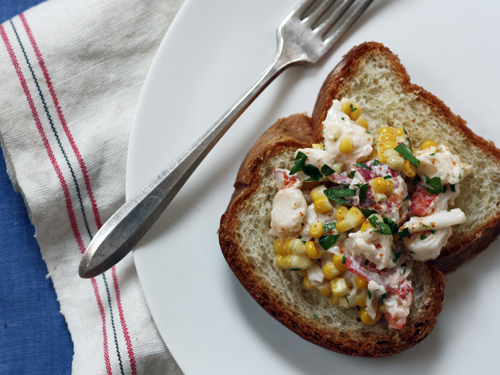 Top each slice of brioche with the lobster salad and serve immediately.